Rev. Elijah Dunbar was the first minister of the community church in Peterborough, which was located then on what is now Old Street Road. Dunbar was called in 1799, and was a strong proponent of the "Liberal Movement.” After 1819, when public funds no longer supported the church, various groups decided to separate and form churches that were more orthodox. The Presbyterians were the first to break away (in 1822), and shortly thereafter, the Methodists and the Baptists followed suit. This period coincided with a rapid shift in the economy. Mills were being built along the Contoocook River and its tributaries. Farming and sheep raising were becoming less important. A mini-industrial revolution was occurring, with more wealth being created, and workers choosing to live closer to their work. The town center accordingly was moved down from the hill into the valley, where it remains today. Not too surprisingly, many of those who were first to seize the new economic opportunities were among the "liberals" who remained with Rev. Dunbar. Thus his congregation was able to erect our beautiful church building very near the new town center, during the years 1825-26. The building was designed by Charles Bulfinch. However, only one year later, this same congregation asked Rev. Dunbar to resign. Apparently he wasn't liberal enough – they wanted their church to become Unitarian. This was accomplished when Rev. Abiel Abbot was called. During the next 13 years, (and then for another 8 years when he was semi-retired), Rev. Abbot contributed greatly to the thriving town. He founded the Lyceum to meet the increasing educational needs of those participating in Peterborough's "industrial revolution." He actively encouraged the start of The Peterborough Academy, which was able to prepare students for entrance to Harvard and other colleges. His greatest accomplishment, however, was to convince the town to begin a free library – the first tax-supported lending library in this country, and indeed the world. The Peterborough Library thrives to this day. In 1856, the women of the town purchased a clock, which was installed on our steeple. This has been the town clock ever since. The present organ was installed in 1866 and completely restored in 2004 after a very successful fundraising campaign. 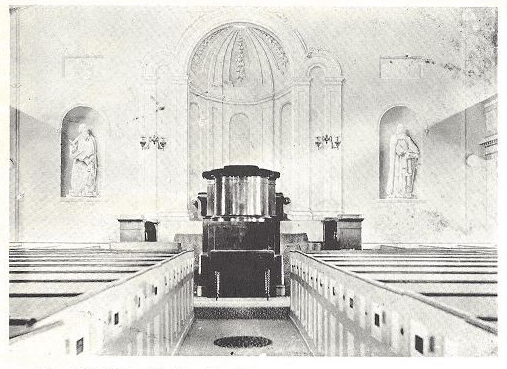 Many changes have been made over the years to the interior of the building, including the addition of the parish hall, which was provided by the Morison family and dedicated in 1926. From 1900 to 1913, William Henry Branigan was minister. After his departure the church had ministers for only a few years at a time, except for Richard Day, who presided over the congregation from 1932 to 1940, and returned in 1969 for the installation of David Van Strien. The 1950s were a busy decade for our church, with 50-60 children registered in church school, a male quartet provided church music, and Thelma Clark served as superintendent of teachers. In 1969, Rev. David Van Strien began his ministry here. At that time the church building was in disrepair due to the weak state of its finances. Seven years later, after a successful capital funds campaign, the building was restored. 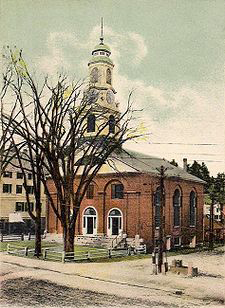 Many community organizations such as AA, WIC, and the Food Co-op were encouraged to use the church's facilities, as it served as both the geographical center and an important focal point in the town. A notable achievement was the revival of the Lyceum. Now named The Monadnock Summer Lyceum, it continues its original function as a resource for adult education, but at a quite different level. Individuals who are widely recognized for their contributions to our evolving society are invited to give a one-hour talk, replacing the usual Sunday service during the summer months. Speakers over the last several decades have include economists; writers; anthropologists and historians; political and social commentators; medical, health care, farming and technology innovators; and progressive religious leaders. Lyceum programs are rebroadcast on New Hampshire Public Radio. During Rev. Van Strien’s 21-year pastorate, the longest since Rev. Dunbar's, another sea change in the economy was beginning. The last of the mills closed down, some small manufacturing continued, but the computer age was beginning and several new businesses, including several computer magazine publishing firms, chose to locate in Peterborough. The church's financial condition greatly improved, enabling for the first time the hiring of a part-time RE director. Throughout his ministry, Rev. Van Strien spoke out strongly for social justice, both from the pulpit and in the community. Upon his retirement in 1989, the congregation made David Van Strien Minister Emeritus. In January 1991 Rev. David Usher, ordained in Australia and most recently from a parish in England, began his ministry. His stay lasted nine years, and then he returned to England with his family. His years of ministry were eventful for the congregation. The upswing in the economy continued and many new families were attracted to the church. This younger generation, with its fresh enthusiasm, was welcomed by all. Rev. Usher was successful in relating to this group, and the RE program was expanded until it became evident that more space was required. Rev. Usher built the congregation up to 230 members, possibly the largest membership in the 20th century, if not in our history. During a three-year period, 1995 to 1998, a successful capital campaign raised nearly $200,000 for improvements to the church building, greatly improving the RE facilities and also installing an elevator to allow handicapped access to the church. An additional $100,000 was taken from the endowment in order to purchase Carll House, an adjacent home. This provided much-needed office space, an additional meeting room, and an apartment for the custodian. Rev. Usher completed his Ph.D. at Andover-Newton during his stay. He also was a prime mover in founding the International Council of Unitarians and Universalists. His ministry generated enthusiasm among most, but dissent among a few. Some of the ill feelings persisted, although most of the current church membership vowed to accept the past and move on into a positive, fruitful future. Sarah Clarke was called to the Church in 2001. She built on the positive contributions of past ministers, and the church underwent further change. The parsonage on Summer Street was purchased, where Rev. Clarke lived. A new, full-time DRE was hired, bringing fresh energy and a wealth of ideas to further develop an already strong religious education program. Several historic events took place during this time: the Church officially adopted the name “Peterborough Unitarian Universalist Church;” we celebrated our 175th anniversary; and the church’s historic tracker organ was completely rebuilt and reinstalled, following a very successful fund drive. Rev. Clark challenged the congregation to be more engaged in the larger community and they responded by establishing the Peterborough Community Supper, a free supper served every Wednesday night, often feeding more than 100 people. Rev. Clarke resigned in 2005 and returned to her beloved New England seacoast. Reverend Fred Gillis joined us in 2005-2006 as our interim minister, followed by Rev. Patience Stoddard in 2006-2007. Lead by Rev. Gillis and then Rev. Stoddard, the congregation did significant processing of these past differences and came to clear understanding of what was needed going forward. We have become more involved with our community through Community Suppers and expect to take a more active role in area social concerns. In 2006 the congregation voted have restuctured our Endowment with the intent to lay to rest old financial confusion and conflict, and honor past donors' intent. The largest share has been dedicated to maintenance of our historic building; another portion is dedicated for social causes; and a smaller, diminishing amount is for certain operational expenses. After a successful search for a new settled minister, Rev. Dr. David Robins was called in 2007 and he served until his retirement in December 2013. Rev. Robins tenure has been a time of great stability and healing for this congregation.